The whole area of Social Media is ubiquitous in today's world along with the smartphone, tablet and Internet use widespread. Facebook, which is the most popular social network in the world, recently released data that indicated that it has over 2 billion monthly users which are an absolutely phenomenal figure in itself. Combined with that, many people have Instagram profiles, Snapchat profiles, Pinterest boards, Twitter profiles and so on. The data that this can provide for Businesses is astounding and that is why most of Facebook's profits come from advertising revenue i.e. brands tapping into the presence of the consumer market that they wish to attract. Other platforms like Twitter, Instagram and Snap offer advertising capabilities (in most territories but not all) but Facebook is very much king in terms of the go-to place for social media advertising. With so much buzz in the last number of years, it would simply be impossible for business owners to ignore the possibilities that it can deliver them but the key issue is the lack of time and/or resources and/or know-how. Many business owners wish to be on these platforms but they practically fear it as they might not know how to engage with their customers, even on an organic basis. The mistake that many retailers make is that they try to be on ALL platforms which unless you're a large-scale retailer is simply not feasible to let alone efficient, that is unless responsibility for maintaining it is assigned to a staff member but there are other issues than that go with that e.g. training. It's so important for retailers to isolate what platform will work best for them otherwise it can sap away lots of valuable time and crucially, not deliver any substantial return on investment. However in some instances, it's simply imperative that retailers are regularly active on their profiles; for example, a fashion retailer should be regularly posting images of things like new stock to their Facebook page or Instagram profile. There is simply no point in creating these profiles however if they're not going to be kept updated; engagement and regular posting is very important which again requires time, effort and creativity. 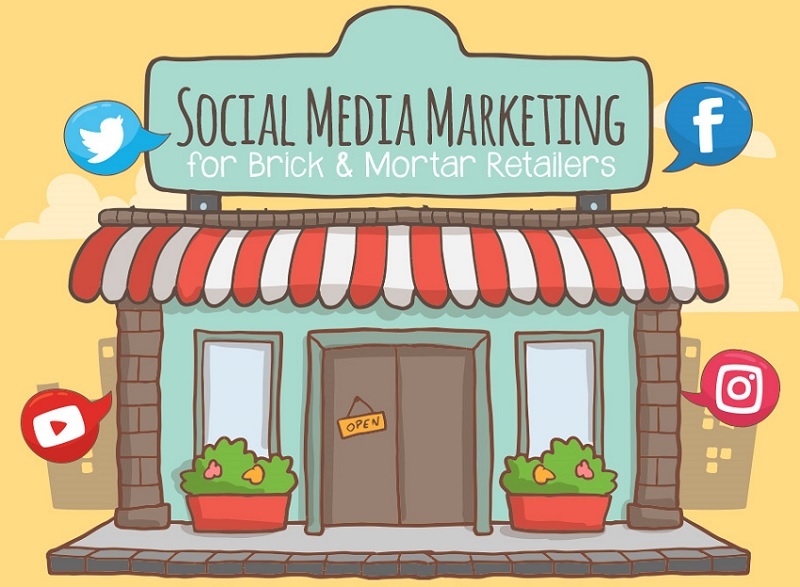 The team at Storetraffic have put together following informative infographic which details everything a retailer (of any size) needs to know about Social Media Marketing Guide for Brick and Mortar. It gives some good advice and indicates how to prioritize what needs to be covered; check the full infographic out below!